Overall, I think this was a great week of service learning. There was plenty of opportunity to grow for the students and I believe this is a perfect program to get new MSU Honors students involved. This program is a benefit to both the mentor and the participant, and being such like-minded yet diverse individuals made it worthwhile. The Honors College is holding a service learning week from Sunday, August 18 through Saturday, August 24, for 40 incoming first-year students. Student participants will live on campus in a residence hall and engage in service projects with different community based organizations, critically reflect with one another on their experiences, and build community with other incoming first-year students. Mentors should possess an ethic of service, with clear commitment to working with MSU and the East Lansing/Lansing communities. In addition, Mentors should demonstrate a desire to work with incoming Honors College students to aid in the new students' transitions to both MSU and the Honors College. 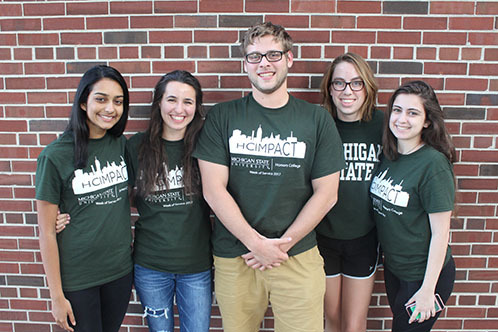 Mentors will have the opportunity to establish relationships in the East Lansing and Lansing communities, engage with the newest members of the Honors College, and work closely with Honors College staff and faculty. Mentors will be asked to move into their on- or off-campus housing prior to the start of the program on Sunday, August 18. During the week of service, Mentors will engage in the following activities: lead community building activities, aid in the transportation of participants (driving vans, etc. ), facilitate reflection and discussion activities, participate in service at various sites around the community, and serve as mentors for the first-year participants. Applicants must be planning to enroll for classes at MSU at least through Fall 2019. The application for HC IMPACT mentors is now closed. Please come back in November 2019 for new information. To view the application prior to applying, please download the application packet. The Google application form should be filled out by January 4, 2019.